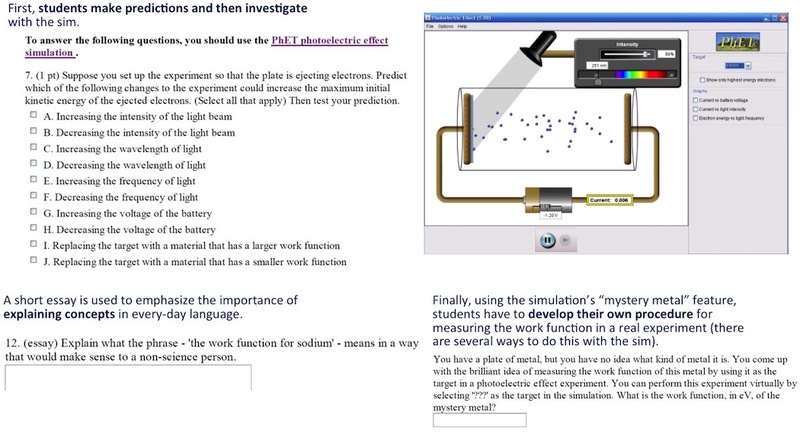 PhET simulations are free, online interactive simulations for teaching and learning science. The impact of these demonstrations is greatly increased when students are given the opportunity to interact with the simulations. This can be done in two main ways: In class or lab environment, or on their own in homework problems. 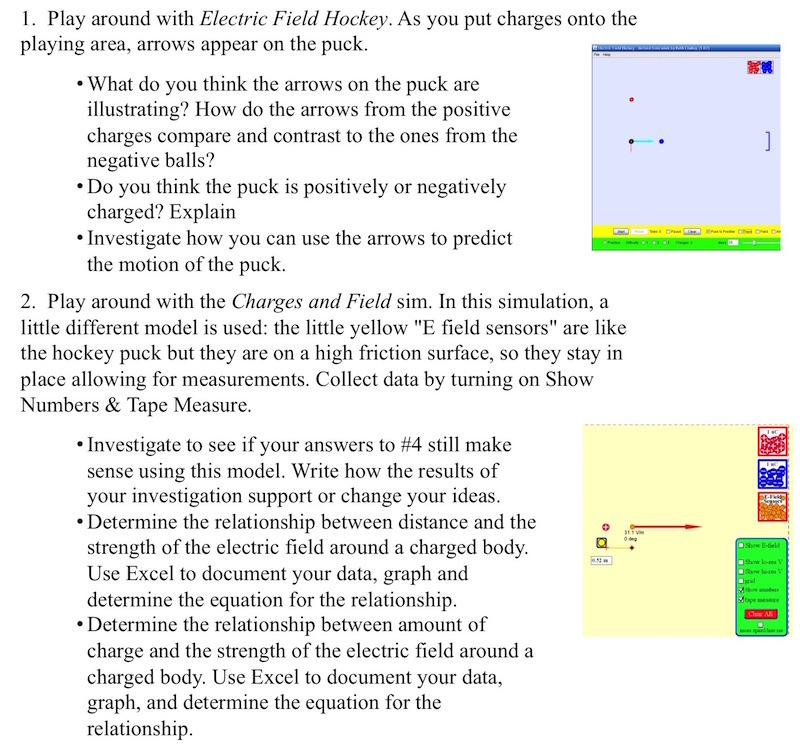 This page discusses the use of PhET in homework. Click here to see all Expert Recommendations on the use of PhET. Even without an instructor present to guide them, students can engage in scientist-like exploration using PhET. This is because PhET simulations are designed to help students explore cause-and-effect relationships and make sense of what they see. To accomplish this, simulations are designed to cue students to explore productively by using implicit guidance; i.e., the choice of controls, visual representations, and immediate feedback provided by visual changes as students explore [Paul et al. 2012, Podolefsky et al. 2012, Moore et al. 2013]. Thus, PhET is ideal for use in homework, and homework using PhET can use minimal directions, due to the implicit guidance in the sims. You can find example homework problems on the PhET website, under each simulation page, and on our Teaching Resources page. How can I use PhET in homework? Excerpts from a homework using Photoelectric Effect demonstrates a range of question approaches. You can use PhET simulations to elicit student ideas about a phenomenon, and get them to start developing a framework of ideas about what is important -- for example, in projectile motion. Student exploration can then be used as a foundation for discussion in class -- as in Just in Time Teaching, especially when PhET is used within the lecture itself. PhET can also be used to prepare students for a laboratory activity -- see our recommendation on using PhET in a lab setting. 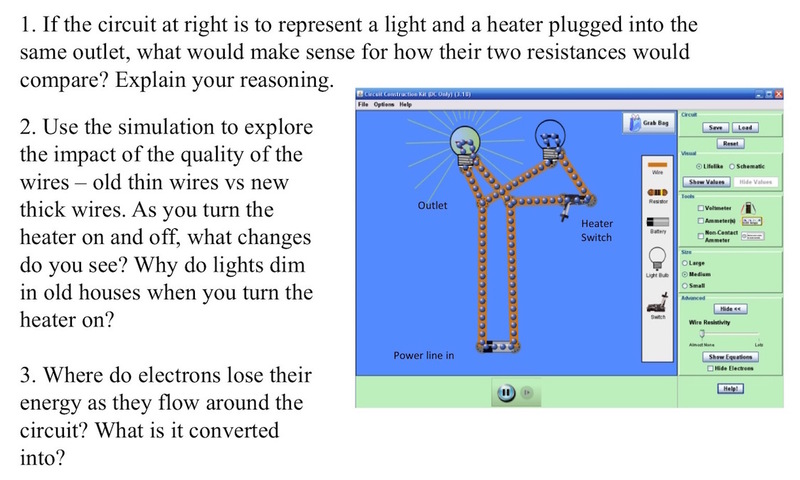 PhET can be used after lecture, or after a lab, to support conceptual reasoning about the science. See the next section for suggestions on writing homework questions which support this kind of reasoning. For very large classes, it is often necessary to auto-grade homework. This situation doesn’t preclude the use of simulations, but does require being creative with homework questions. At the University of Colorado, we have used a combination of conceptual multiple choice, true-false, and numeric answer questions. For example, “select all of the actions which will result in X,” or “If I do X, will Y increase/decrease/stay the same?” If you can embed images in your questions, you can show a specific simulation scenario and ask students to predict behavior or interpret the scenario. It’s best to include at least a few short essay questions which require students to explain their reasoning. How do I get my students to explore productively in a PhET-based homework? Keep your questions short, focused on just one or two learning goals. Longer homework questions can lead lead to a focus on just ‘getting through’ the questions. Eliminating any explicit instructions on how to use the simulation often helps to keep the questions concise. Students probe deeper into circuits using Circuit Construct Kit to explore household wiring and the effect of old thin wires versus new wiring; i.e., wire resistivity. 3. Give open-ended questions and challenges. What types of prompts can we use instead of step-by-step directions? Challenge prompts encourage students to engage with the sim and explore ideas more deeply. [Chamberlain et al. 2014, Adams et al. 2008] To come up with such challenges, sit down and play with the simulation yourself, to see what it can do. How can you make…the gravity force… bigger? How can you create… the smallest non-zero acceleration? Develop a procedure for… identifying an unknown material (e.g., in Density sim). 4. Connect to the real world. Ground your questions and ideas in familiar, real-world experiences. Students learn more when they can see that science is relevant to their everyday life. Where possible, ask questions in the activity that help them relate science to their personal experience. For example, in a simulation exploring color vision, have them relate the ideas in the simulation to how a color television works. 5. Make use of sim features and examples. 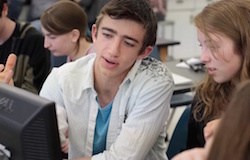 Students are drawn to games or challenges in the sims. You can use these games in the homework questions, rather than forcing students to choose between what the sim encourages and what the homework asks for. Use the visual nature of the sim to your advantage, and ask students to explain phenomena with both words and pictures. You can also incorporate sim images and representations into the questions themselves. Keep your questions focused on the simulation!! Keep conceptual questions focused on the simulation, to encourage students to view the sim as a useful resource. Save extension questions, that reference examples or values from outside of the simulation, for the end of the assignment. 6. Help students check their understanding. 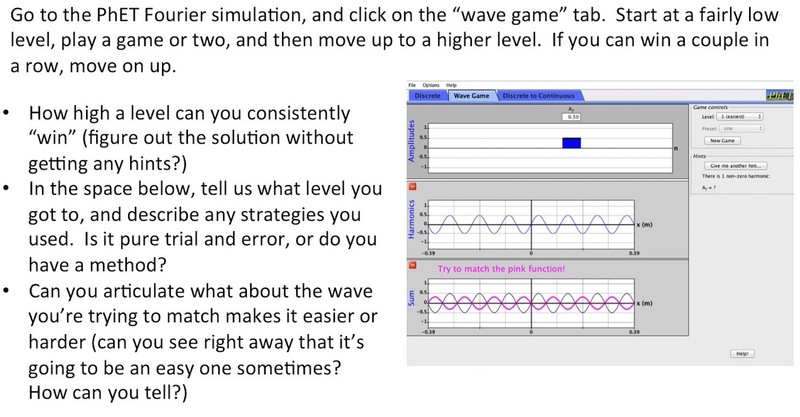 Students can check their own understanding using the simulation. 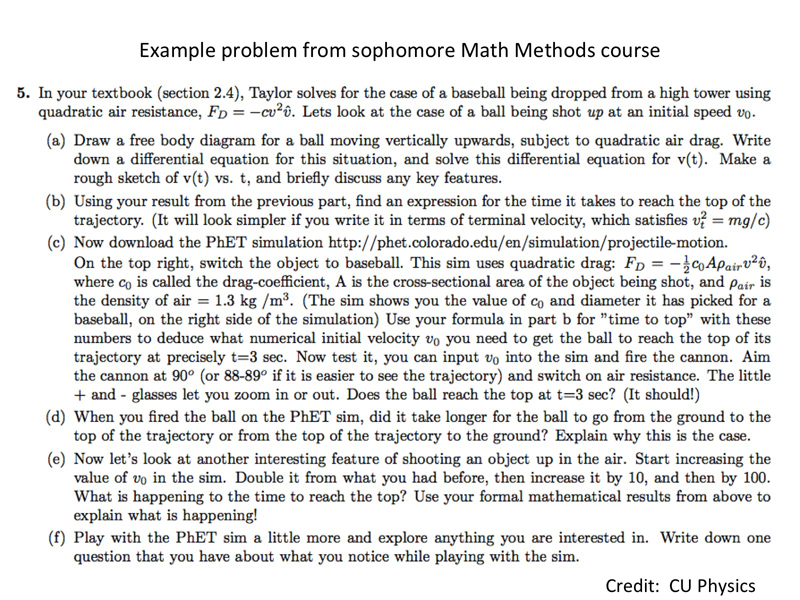 For example, ask students them to numerically predict the maximum height of a ball subject to drag, and check it with the PhET Projectile Motion simulation, as in the example. Tables help focus students on productive investigations, without needing many directions or overwhelming students with detail. Plus, when students to record responses to open-ended questions in tables, it’s easy for graders to quickly see if students are getting the key ideas. For more examples of different types of tables, see our recommendation on designing in-class activities for use with PhET. Examine how different photons in the simulation affect each molecule. Record your observations in a few words. As with any homework, students will be able to make the most out of the simulation if they feel that it is clearly connected to other parts of the course. This could include using the simulation as a lecture demonstration and clicker questions before and/or after the homework, and including related questions on quizzes and exams. To leverage the familiar context of the simulation, use screenshots (e.g., on clicker and exam questions). You can find more example homework problems on the PhET website, under each simulation page, and on our Teaching Resources page. Unless otherwise specified, images and activities are courtesy of PhET Interactive Simulations and/or Department of Physics, University of Colorado Boulder.